The August Recipe Share and Giveaway looks very similar to the July one but…Augustier. If you find yourself making one recipe on repeat every August, THAT’S the recipe we want! If no picnic is complete without your deviled eggs – share that recipe! If you’ve got a great way to use up eggplant and zucchini, now’s the time to let it shine. This is all about what’s seasonal, local, and delicious. You can still find tomatoes and berries for a while. Melons, onions, eggplant, and squash are still booming. Peaches and peppers are poppin’. New potatoes and fingerlings are making their way around. 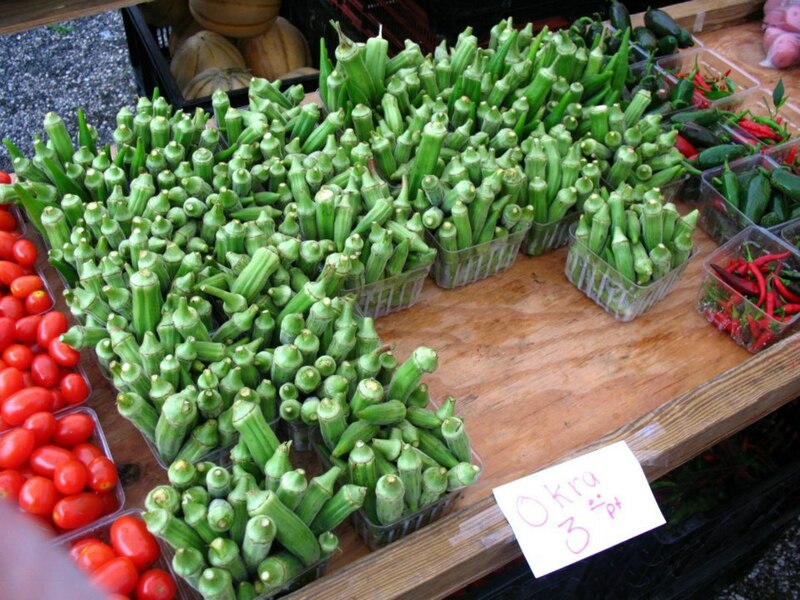 And okra is everywhere! Mushrooms and herbs are doing great this year, and of course, you can find plenty of dairy, eggs, and meat, good ol’ meat; It’s always in season. Post your favorite July recipe in the comment section below, and you’ll be in the running to win a produce basket from participating GrowRVA farms, filled with the market’s freshest and best. *My Nicaraguan husband’s family makes this dish with Chayote (a hard, Mexican squash) but I use summer squash from the garden. 1. Heat a large saucepan over medium heat. Add oil and sliced onion. Cook slowly, until onion is very soft and almost carmelized, about 10 minutes. 2. Stir in sliced squash, stock and salt to taste. Cover and allow squash to steam until soft, about 5 minutes. 3. Turn off heat, squeeze juice of lemon over top, sprinkle with pepper and more salt if necessary (but not too much salt since the cheese is very salty.) Serve with a generous amount of crumbled cheese over top and garnish with chopped cilantro if desired. I made Jalapeño Lemonade this weekend with peppers from the market. So good! These Hatch Chile Mexican Pizzas were made with Hatch chiles from New Mexico. Local market items such as ground beef (Sunnyvale Farms), jalapeños, tomatoes, onions and garlic were used for the pico de gallo and enchilada sauce! moussaka from an Australia school cook book. 2.Heat olive oil in pan and saute onion & garlic until soft and golden (I just make sure you can see thru the onion and I use a lot of garlic). 4. Add tomatoes, oregano, pepper and simmer for 10 mins. 5. Take the eggplant and pat dry with a paper towel. 6.I then fry or grill eggplant slices for about 5 mins each side until cooked. 7. Layer eggpland and meat sauce ina greased casserole dish. 8. Lightly beat cottage cheese and eggs and pour over mixture in caserole. 9 Sprinkle with nutmeg and bake in a moderate over, 190c (I do it in about 325f) for about 40 min until the top is goloden bronw. I love to make Succotash in the summer. 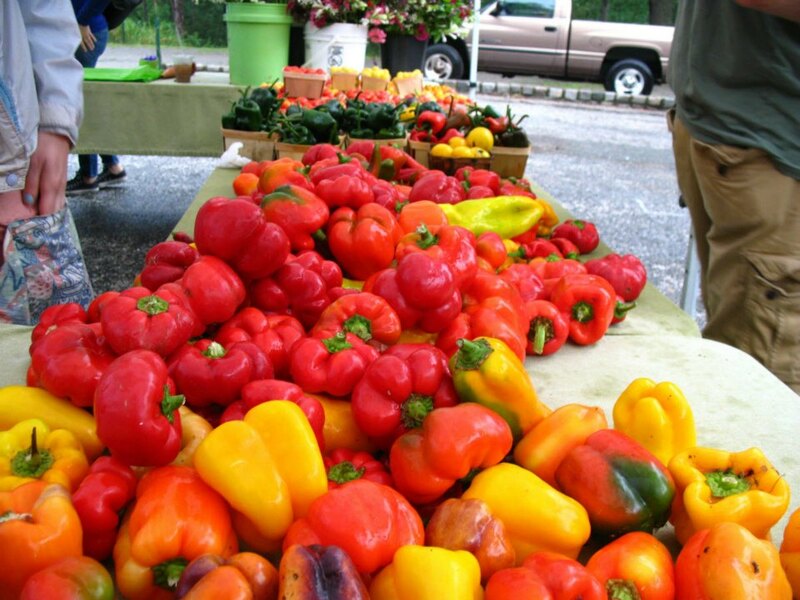 I use fresh lima beans, corn, tomatoes, zucchini – whatever I find at the market. This is a good base recipe but you can mix this up with whatever you have. We’re always happy to see Tomatillos in our Tomten Farm CSA bag, so I can make this recipe. I substitute sliced fresh basil. This salad is best eaten the day it is made. Wondering what else to do with cantaloupe? This CANTALOUPE BREAD is scrumptious! Beat eggs and butter til creamy, about 2 minutes. Add sugar and beat until creamy, about 2 minutes. Sift the dry ingredients together and blend into the mixture. Gently stir in the mashed cantaloupe and nuts at the end. Bake in buttered and floured pans at 350 degrees for about 45 minutes, but test for doneness at 35 minutes. I like to eat this warm with butter and some home made peach jam. It’s also good with a light layer of cream cheese. Awesome for breakfast, snack or dessert. Karen Duke, you’re our winner! Congrats, and thanks for sharing your recipe with us! We’ll email you with more details. My favorite thing right now is Poblano peppers! I cannot get enough of them! One of my favorite recipes is Chili and goat cheese stuffed poblanos. I don’t mind whipping up a quick batch of chili if I don’t have some leftover and frozen in the freezer. (especially with all the yummy tomatos right now) First I hollow out the poblanos, and the toss the seeds. I mix chili, cooked Quinoa and little chunks of Beemster goat Gouda, and proceed to fill the poblanos and set in a baking pan. I slow roast them and towards the end grate a little more cheese over top. the chilli and fillings ooze out of the chili and it’s a cow dairy/ gluten free version of Chili Relinos!! And can be made vegetarian!! So good!! Gazpacho has to be my July favorite! Tomatoes…onions…cucumbers…peppers…garlic…PERFECT! 1. Cube the summer squash and sweet potato and boil until fork tender. Drain thoroughly and then mash or run through food processor with butter and milk. Set aside. 2. Sautee beef and onion until beef is browned and onions are soft. Drain. 3. Add corn kernels, peas, tomatoes and spices to beef mixture. 4. Spread beef mixture into 9×12 in. baking dish coated with baking spray. Cover with summer squash mixture, leaving little “peaks” and “crevices” – don’t make it totally smooth! 5. Bake, uncovered, at 350° for 25-30 minutes or until peaks in squash mixture are a golden brown.